I was asked to elaborate on the differences between my forthcoming lectures at the Conference on "Contact With Space" in Athens, Greece, in just a few weeks, and my Seminar at the OBRL headquarters in Ashland, Oregon, USA, in mid-August. Basically, I will cover the same materials, but the lectures in Greece will be simultaneously translated into that language, offering Greek people who don’t speak fluent English a unique opportunity. The Greek Conference also has two other presenters, Peter Robbins and Richard Dolan. The Greek Conference organizers have graciously invited me to give a full one-day presentation of my work, divided into four lectures, two in the morning, two in the afternoon. 1. My Saharasia discoveries on the origins of human armoring and war, rooted in Wilhelm Reich’s work on sexuality (genitality) and family structure, and how those factors work towards generation of either peaceful or violent societies. My work also uncovered a major geographical factor at c.4000-3500 BC, the biggest real climate change since the end of the last Ice Age, as the trigger for development of the earliest armored and violent human societies. A lot of new evidence has come from the mainstream of science to confirm my findings, made back in the early 1980s, with nothing of significance to oppose them. As such, it is a powerful vindication of Reich’s early work, and solution to what he termed the riddle of the origins of human armoring. 2. 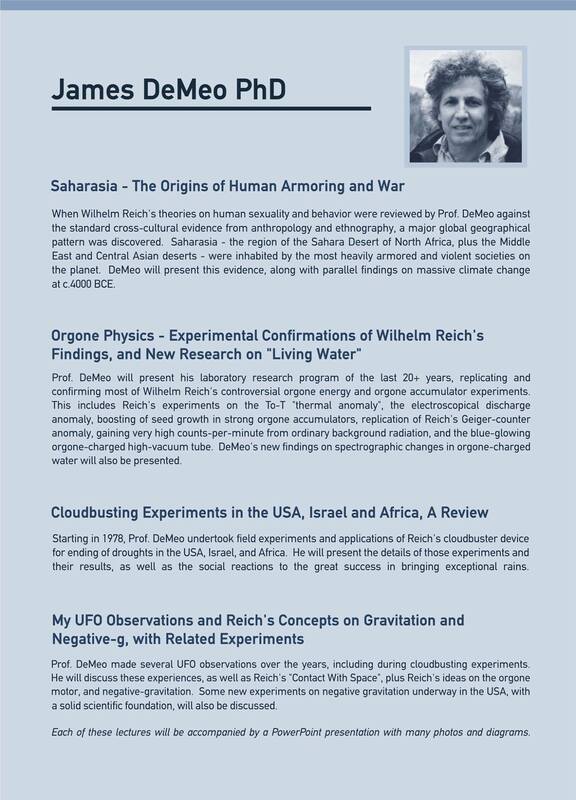 Orgone Physics – Experimental Confirmations of Reich’s biophysical work, and new research on "living water". Over the past decades I’ve made significant and "bullet-proof" experimental confirmations of Reich’s most central experiments on orgone biophysics. These include the To-T, electroscopic, VACOR-tube, and boosting of seed-growth in the orgone accumulator, and other confirmations. My newer work on changes in water structure and spectroscopy when charged inside an orgone accumulator, is also of great importance, confirming orgone energy as a force for creating "living water". 3. Cloudbusting experiments in the USA, Israel and Africa, a Review. I began this work in 1978 within the university system, and confirmed Reich’s claims about how the cloudbuster could influence the weather over very large regions, to end droughts and even green deserts. Here I will present the hard data and evidence from field trials and experiments in the USA, Israel and 13 separate expeditions into the drylands of Africa, with oftentimes dramatic and nearly "unbelievable" results. 4. Reich’s last works, highly controversial and mostly unconfirmed, will also be addressed. These include his concepts of oranur, cosmic superimposition and gravitation, cosmic ether and orgone energy, and Reich’s UFO observations in Tucson during cloudbusting experiments, the subject of his last book "Contact With Space". I’ll relate my own UFO observations, and also cover what I believe are the best possible routes for direct experimentation on this subject. At OBRL, these same materials will be offered over two days, in English only, where each of the four subject areas will be covered in greater depth, given about twice as much time as in Greece. Furthermore, at OBRL in the USA, I will make demonstrations of apparatus that are impossible to bring over to Europe. Seminar guests will also have the opportunity to experience the strong charge of our orgone accumulators, make observations in the orgone accumulator darkroom, and have a look at sand bions in the microscope. The OBRL event will also include an optional one-day field trip to nearby Crater Lake National Park, with the bluest water in the world. In either case, Greece or Oregon, it is a lot of material to cover, and will be exciting for both the newcomer to orgonomy, as well as the old hands – covering the vast territory of Wilhelm Reich’s orgonomy, the science of life-energy functions in nature, with many new findings and verifications. Right now, they still have the 2016 program posted up, but will update it to 2017 later in summer. Thanks for reading, and hope you can attend one or more of these exciting events. This entry was posted on May 29, 2017 at 10:48 AM and is filed under Uncategorized. You can follow any responses to this entry through the RSS 2.0 feed. You can leave a response, or trackback from your own site.